Only minutes into the long-awaited Board of Appeals hearing last night at the Laurel Municipal Center, there was a major surprise when an attorney for Pure Hana Synergy—the applicant attempting to purchase the Tastee Diner—addressed the committee in the opening moments. And just like that, the meeting was adjourned. I’m very happy to report that the legendary Tastee Diner will not be turning into a medical marijuana dispensary, thanks largely in part to those who signed the petition and supported the efforts to save this rare and special building. While our community activism certainly played a big role in this result, those of us rallying to “save the diner” actually shouldn’t get all the credit (or the blame, depending which side of the fence you were on) for the Pure Hana deal falling through. It ultimately came down to the City of Laurel’s own Municipal Code, which includes strict criteria for medical marijuana dispensaries—more than one of which should have disqualified Pure Hana from ever applying for the Tastee Diner location in the first place. First, there was the issue of the “one mile rule” in relation to any other medical marijuana dispensary. This rule was initially the focus of some creative interpretation, as the Diner site is well within one mile of Revolution ReLEAF, the dispensary just north on Route 1 at the former Sam & Elsie’s bar. Pure Hana proponents likely would have argued that because Revolution ReLEAF is located outside of the 21st District in Howard County, the one-mile rule doesn’t apply—even though the COMAR code clearly says that “the premises may not be located within one-mile of any other licensed premises.” It doesn’t specify District limits. But again, the code seems open to interpretation. How exactly is the distance measured—is it door to door, or is it from property edge to property edge? The distance between the Diner’s location and that of this new dispensary set to open soon at Tower Plaza could also easily have been challenged. But it’s actually another rule in the Municipal Code that likely would have nullified this deal for good. Good evening. My name is Carl DeWalt. I retired from 22 years with the Laurel Police Department and proudly represent the Ward 1 Citizens of Laurel on the City Council. I am here tonight to urge the Board of Appeals to uphold the decision of the Laurel Planning Commission to not recommend approval of the application of Pure Hana, also known as SH Realty Holdings LLC, to operate a medical cannabis dispensary. While I believe that the Tastee Diner has important historical value and should be preserved, that is not the reason I am here tonight. Two reasons lead to the conclusion that not only was the Planning Commission correct in its recommendation, but the Pure Hana application should not have proceeded to this point at all. First. We have enough marijuana dispensaries. As the Planning Commission noted, Laurel already has an approved Medical Marijuana Dispensary set to open very shortly. • Distance is very close to the 1-mile mark, and if one uses the traditional legal definition of premises, the case can be made that the Blue Pharma company dispensary is less than a mile –4905 feet property line to property line. • Do we really need 3 dispensaries in a 1.8-mile radius? • There is another dispensary operating on Rt 198, in Burtonsville. • How many medical dispensaries do we need? • How many do we need in the Laurel City limits? • When the City passed its amendment to the unified code, was their intention to make Laurel a marijuana mecca? I don’t think so. I hope not. And I hope you don’t think so either. My second, and more important point addresses the fact that this application should never have been allowed to proceed this far. • WHY. The Tastee Diner location disqualifies it from being a medical marijuana dispensary. Premises shall not be located within 1000 feet of a lot line of a public or private school, or real property owned by the Prince George’s county Board of Education or house of worship. I draw your attention to the Prayer Tower Bible Way Apostolic Faith Church, 12 2nd St, Laurel, MD 20707. 1. Image of sign and Church entrance. This well-established faith community is less than 1,000 feet from the Tastee Diner. As the crow files, its 668 feet door to door. Less if you consider it lot line to lot line—which is the proper measurement. Walking along established roads it is 747 feet. 2. How do I know these figures? Google Maps Distance feature, P.G. County’s own tool, P.G. Atlas, a laser Bushnell range finder and a surveyor measuring wheel. Under any measurement, the distance between Tastee Diner and the Prayer Tower Bible Way Apostolic Faith Church is less than 1000 feet. 3. According to the City’s own ordinance, which says a dispensary must be 1,000 feet from a house of worship, this application does not qualify for approval. On the basis of both these factors I ask you to uphold the Planning Board’s recommendation. I suspect that no one—from either the Pure Hana camp or within the City of Laurel’s Department of Economic and Community Development—ever noticed that there is, in fact, a church less than 1,000 feet from the Tastee Diner. Perhaps because it isn’t in what we’d consider a traditional church structure, it was simply overlooked. But there it is—in the small strip mall at the opposite end of Dottie’s Trophies. Between the sheer number of other dispensaries in the area, the questionable distance between dispensaries both north and south of the Diner, and now the realization that there’s an established church less than 700 feet away, it’s now clear that this location was just never meant to be a medical marijuana dispensary. While I think we’d all love to know how the Board of Appeals would have voted, it’s probably best for the City of Laurel that they didn’t have to. Because had they somehow decided to overturn the Planning Commission’s recommendation—especially in light of these facts—the optics would have been quite bad. For the record, I don’t suspect that they would have done that. But I both admire and respect Pure Hana’s decision to withdraw their application. While the immediate threat has been eliminated, the Diner’s future is still very much in jeopardy, however. Owner Gene Wilkes was understandably disappointed in the deal falling through, and remains eager—perhaps more so than ever—to sell the property. After last night’s meeting adjourned, he hinted at considering simply “closing it down and boarding it up.” Given the resurgence of business since news of the potential sale first broke, let’s hope that Mr. Wilkes doesn’t make any such rash decisions. But that’s something that we, as supporters of the Diner, need to help with—please continue to frequent the Diner and encourage others to do so as well. Saturday’s “Diner Appreciation Day” saw a fantastic outpouring of support—support that can be sustained. People who may have taken the Diner for granted over the years are thankfully rediscovering its appeal, and they’re spreading the word; and those who are experiencing it for the very first time are quickly hooked on its authenticity, and its affordability. It’s entirely fitting that on the very day that the dispensary drama would be resolved, the latest issue of the Laurel Leader came out with this as the cover story. Now is the time for the City of Laurel to work with Mr. Wilkes on a way to purchase the Diner for the City’s Historic District. Mayor Craig Moe has already gone on the record, asking that Laurel be given the right of first refusal for any future sale—well, that availability is here. And with the help of state and county preservation grants, crowdfunding, and willing investors, it can be done—and the long term benefits would be immeasurable. In the meantime, please continue to to support the Tastee Diner and its hardworking staff. Packing that parking lot on a regular basis is the surest way to keep the City’s attention… and more importantly, to keep the Diner open. Saturday morning, January 19th was an extra-special day at the Tastee Diner. The Laurel History Boys’ “Diner Appreciation Day” saw an outpouring of residents and diner fans from all over the region. Between trying to eat breakfast and chatting with as many folks as possible, it was hard to get an accurate headcount—but the parking lot remained full from before the event began at 9AM until well after noon. And Sunday was a near-repeat, as the diner was packed once more. The purpose of this event was twofold: we wanted to thank diner owner Gene Wilkes and his hardworking staff for the nearly 43 years they’ve maintained the Laurel location. We also wanted to remind Mayor Craig Moe and the City of Laurel that the diner remains important to this community, and that the City’s Community Redevelopment Authority should explore every available opportunity to purchase the endangered building (if not the full property itself) if and when the Pure Hana Synergy application is officially denied. The Board of Appeals hearing is scheduled for this Thursday night, January 24th at 7PM at the Laurel Municipal Center. Saturday morning attended “The Diner Appreciation Day.” The parking lot was completely full and the Diner was packed with our hometown residents. The honorable Prince George’s Co Councilmember Tom Dernoga and members of his staff attended and enjoyed a delicious Diner breakfast. Edith, my new friend, told us she has been coming to the Diner for the past 40 years and considers the Diner “Home” and the Diner staff and patrons family! Since 1985 when I became a resident and employee of the City of Laurel the theme surrounding Laurel was the revitalization of Main St. History indicates this has been a very very slow process. The outpouring of support I witnessed yesterday for the Diner by our citizens is a golden opportunity to help preserve that structure, move it to Main St. and finally achieve a huge step forward in this revitalization process! The pending sale to Pure Hana Synergy was unanimously denied on December 11th, and while the medical marijuana dispensary firm has been planning its appeal, I believe that we’ll ultimately learn that their application never should have received the City’s initial endorsement. A town’s Municipal Code can only be bent so far, and Thursday night’s hearing should remove all doubt. While most are optimistic that the Board of Appeals will uphold the Planning Commission’s recommendation, the diner’s future is far from safe. Owner Gene Wilkes has made it abundantly clear that he still wants to sell. He mentioned having at least two additional offers on his property–both of which would result in the loss of the diner. This is why it’s imperative that the City of Laurel work with him (or his prospective buyers) on a solution that would allow the diner car to be preserved and relocated. Mr. Wilkes spoke at length about the challenges he’s faced for years while running the Laurel diner, particularly with keeping it open 24 hours a day in a location that has been prone to crime. He also spoke about his refusal to ever allow it to be designated as a historic property, citing regulations that the City imposes on such properties, and how he believes it would only further hinder his ability to sell. Despite his pleasant and courteous demeanor, I think Mr. Wilkes still views anyone interested in saving the diner as somehow impeding his right to sell it. I’ve tried to explain that this isn’t the case at all. He has more than earned the right to sell and retire. Pure Hana Synergy’s application to purchase it simply should’ve been negated long before it reached this point—and that has nothing to do with diner preservationists, but everything to do with the City’s own Municipal Code. We’re only interested in seeing the building relocated to Main Street, where a new owner can be incentivized to breathe new life into it. As Saturday’s event showed beyond a doubt, there is an abundance of love for this diner; and with proper advertising and sustained community engagement, it clearly has tremendous potential for the Historic District. The City of Laurel should be exploring ways to purchase it, protect it, and give it the historic designation it deserves. Based on his extensive experience in Laurel, Mr. Wilkes is correct on many points which reinforce his desire to sell the Laurel location. But by the same token, it’s unfair to measure the Laurel diner’s performance against that of his other locations in Bethesda and Silver Spring—areas that have nearly triple the population and more robust economies. In the hands of a motivated new owner—an owner who will perhaps decide to limit the business to regular operating hours, consistently engage in public outreach efforts, (much like the highly-successful 29 Diner in Fairfax does) and take full advantage of the many preservation grants and incentives available to a historic location—this diner can positively thrive. Please plan on attending the Board of Appeals hearing this Thursday night at the Laurel Municipal Center, and let City officials know that you expect them to do right by this historic diner. There are numerous resources to explore, including crowdfunding, angel investors, and others who could contribute to a hugely successful relocation and reopening on Main Street. 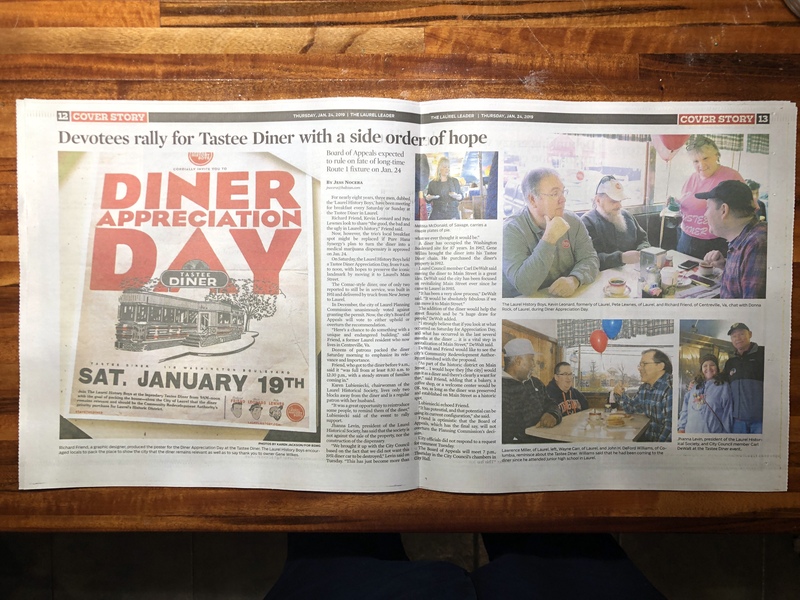 Join The Laurel History Boys Saturday morning, January 19th from 9:00 AM–12:00 PM at the Tastee Diner, as we hope to draw an an extra-large breakfast crowd of Save the Diner supporters! It will be the last weekend before the pivotal Board of Appeals meeting that will decide whether or not Pure Hana Synergy can purchase the site and convert it to a medical marijuana dispensary. That hearing is tentatively set for Thursday, January 24th at 7 PM at the Laurel Municipal Center. The hearing, originally scheduled for December 20th, was delayed by over a month at Pure Hana’s request after the Planning Commission unanimously voted to deny their application at the December 11th meeting. While it’s expected that the Board of Appeals committee will uphold the ruling, Tastee Diner owner Gene Wilkes has made it clear that he still intends to sell the property. After nearly 43 years of operating the Laurel location, he’s earned the right to retire. When Mr. Wilkes took over the diner in 1976, he technically saved it, himself. Had it not become part of his Tastee Diner chain when it did, there’s a very good chance that it wouldn’t have survived into the next decade. Much like Outrider’s Diner just up the street in North Laurel, it would have disappeared from the landscape before generations of Laurelites could enjoy its affordable fare and authentic 1950s ambiance. As a way of saying thank you to Mr. Wilkes—and showing the City of Laurel that the diner remains a relevant and vital part of this town—we’re asking you to come out to the diner in force Saturday morning, January 19th. Whether it’s just for a cup of coffee or a full-blown breakfast, please come support the diner and its hardworking staff. With over 2,300 petition signatures, we’ve already shown the City leaders that people want to save the diner. Now let’s show them in person, en masse. With the Pure Hana deal out of the picture, this is the opportunity for the City of Laurel’s Community Redevelopment Authority to step in and make an offer for the property—or, at the very least, to negotiate a purchase of the diner itself—in order to relocate it to property that the City owns at 312 Main Street. Adding the diner to the Historic District would bring long-term benefits the likes of which the CRA will probably never see again. Once it receives historic designation, the diner would qualify for state and county preservation grants, among other funding. The Maryland Main Street Program, which Laurel is now a part of, would provide further aide in this transition. But most importantly, the City should, by now, see the economic potential that this diner would bring to Main Street. If they don’t, a large turnout with media coverage will make the picture even clearer. On Tuesday night, a rare capacity crowd filled the Laurel Municipal Center to help determine the fate of the Tastee Diner—the sale of which is pending to Pure Hana Synergy, the medical marijuana dispensary which plans to modify the historic building to fit its usage. After an emotional session that ran over an hour and a half, the City’s Planning Commission voted unanimously to deny the recommendation to the Board of Appeals. Pure Hana’s owner, Francesca DeMauro-Palminteri, spoke at length about her intention to bring the alternative medicine to Laurel, citing its benefits—particularly to veterans suffering from PTSD and other disabilities. Members of the Planning Commission had a few initial questions for Christian Pulley and Robert Love of the City’s Department of Economic and Community Development, who’d frankly treated this hearing as a formality. When asked for an update on the City’s most recently approved dispensary—Mr. Love reported that the facility plans to open in approximately 30 days in the shopping center at Route 1 and Cherry Lane. The district extends across both Prince George’s and Anne Arundel counties, from College Park to Odenton—and only two dispensaries are allowed to serve it. Laurel already has one of them—the aforementioned dispensary slated to open next month at Route 1 and Cherry Lane. If Pure Hana is awarded the second location, both would be in the city of Laurel limits—barely over a mile apart (and take special note of that—we’re going to come back to this point shortly). The concern from the Commission was valid—isn’t that going to cause yet another traffic problem, with everyone in the 21st District having to come to Laurel? The anxiously-awaited public hearing was opened, and a number of speakers approached the podium, including Jhanna Levin of the Laurel Historical Society—who lamented the negotiation between Pure Hana and Mayor Craig Moe last Friday, which would still result in the destruction of the diner. I started the petition that now has over 2,300 signatures urging the city to find a way to relocate the historic—and it is historic—Tastee Diner to Main Street. There’s a line in the 1982 Barry Levinson film, Diner, that says simply, “We always have the diner.” For nearly 90 years, that’s a sentiment that’s been true in Laurel. Not only have we always had the diner, it’s been open around the clock—24 hours a day, 7 days a week. The only time it’s closed, is Christmas Day. So it’s sadly ironic that as we near the holidays, this might be the end of the road. Worse, the City’s rushing to push this sale through. Pure Hana isn’t just taking over any old building. It’s taking over a legacy. Because we have always had the diner. If you grew up in Laurel, you know it’s part of the city’s fabric. Your parents ate at this diner before you were born… Your grandparents ate at this diner. If you were fortunate to grow up and leave Laurel for bigger and better opportunities, you knew that whenever you came back, you’d always have the diner. That’s something not many towns can be proud of anymore. An authentic diner that’s literally served us for generations is something that should be celebrated—not rushed to its demise. I’ll say this again: The City of Laurel has a chance to do something truly special. When you first learned that this diner was quietly up for sale, something should’ve clicked in your collective mind… and said, “We need to save this building… We need to move this diner to Main Street.” Even if you didn’t realize what you had, you’re surrounded by people who value this town’s history. And we would’ve told you in a heartbeat. The City refuses to explore any of these ideas for relocating the diner, where it could be revitalized under new ownership—and Pure Hana could open according to their original plans, without this façade modification that would only serve as a constant reminder of a lost opportunity for us all. The City already has resources—the Maryland Main Street designation, packed with relocation incentives; the Community Redevelopment Authority, who’s been conspicuously and inexcusably absent through all of this, despite owning the very land on Main Street that could accommodate the diner. I’ve explained why this would be a good thing. Before you agree to this sale, it’s time for the City to explain why they think it isn’t. Of the three Tastee Diners in Maryland, only Laurel’s has never been listed as a historic landmark. This is a grievous oversight by the City, which has always had the authority to designate it. It’s one of only two remaining Comac diners known in existence. It’s the model that inspired the American stainless steel diner archetype. Regardless of what Mayor Moe or anyone else says, it is historic. And it belongs on Main Street. When the diner’s previous owners, Walter and Harry Susini, signed the first lease in 1933, they purchased the land from John H. Fetty—who happened to be Laurel’s mayor at the time. The deed says that the property already included a building “known as the Laurel Diner”. So it’s ironic that this diner’s lengthy history actually began with a mayor who made sure it was poised for long-term success. Today’s mayor, for whatever reason, seems a little too eager to be rid of it. After the final speaker had shared her concerns about the potential loss of this essential piece of the community, the Planning Commission set about its business. And the subject of distance and oversaturation came up again in the motion made by Rick Wilson. I strongly believe that we have adequate coverage of medical marijuana. Anybody that needs it can drive 3,700 feet from this location to the north and go to an existing dispensary… four and a half miles to Burtonsville, and there’s an existing dispensary… and 5,282 feet to Cherry Lane, and there will be a dispensary within X number of days. I don’t believe we need another dispensary. So I would move that we deny the recommendation to the Board of Appeals. Those in attendance (at least, those not on the Pure Hana payroll) broke into applause—applause that only intensified when Mr. John Kish seconded the motion, and the reality began to sink in that this sale was not going to be approved. As the roll was called, each member of the Commission unanimously carried the motion. Washington Post reporter Dana Hedgpeth (who’d just written a great piece in Sunday’s paper) was there for a follow-up report, and Fox 5 News was on the scene to produce a segment as well—which I had the surreal pleasure of watching on one of the TVs at (where else?) the Tastee Diner. While at the diner, decompressing with a grilled cheese and cold beer, one of the cooks appeared from the back kitchen. Charles Durocher, a Vietnam veteran who proudly displays that honor on the baseball cap he wears, came over and shook my hand. The diner staff had been watching the Laurel TV broadcast of the Planning Commission meeting live. “I just wanted to say thank you.” Charles is one of at least two veterans I know of who work at the diner—hardworking veterans who’ve continued to do their jobs in spite of the palpable fear that the business will soon be sold. I immediately thought of the veterans that Ms. DeMauro-Palminteri had spoken of earlier in the evening, and wondered if she’s aware of the veterans at the diner, whose modest jobs depend on that diner staying open. Pure Hana didn’t comment after the ruling, but they’re expected to appeal the decision at the December 20th Board of Appeals meeting, also at the Laurel Municipal Center, starting at 7PM. I would urge everyone to attend that meeting as well, just in case the Boardmembers interpret anything differently. After talking to Councilman Carl DeWalt, the stipulation that dispensaries must be at least one mile from each other within the city took an interesting turn. Is that rule really limited to “within the city”—or is it literal? I’m not a lawyer—or a politician, (and God knows I’d never want to be either) but that document doesn’t say anything about the one-mile rule being limited exclusively to within the City of Laurel. It says “The premises may not be located within one-mile of ANY other licensed premises of a licensed dispensary of Medical Cannabis”. And it says that’s a Maryland regulation, not a City of Laurel one. If that interpretation is correct, now you have to take into account the even shorter distance between the diner’s location at 118 Washington Blvd. and Revolution ReLeaf—the dispensary just up the street at the former Sam & Elsie’s. That’s definitely less than a mile away. Or, as Rick Wilson astutely noted, it’s only 3,700 feet away. Needless to say, somebody’s going to have a lot of explaining to do, if it turns out that Pure Hana never should’ve even gotten this far along in the process. That seems like an important point that they should’ve squared away long before any of these plans developed. That having been said, assuming the Board of Appeals upholds the Planning Commission’s recommendation, what’s next? We’ve finally heard from Tastee Diner owner Gene Wilkes, who admitted to the Washington Post that he’s had it up for sale for the past five years. He still wants to sell, and at 75 years old, that’s certainly his right. Now is the perfect opportunity for the City of Laurel to rectify a few things. The diner needs to be given the historic designation it deserves, first and foremost. Next, the City of Laurel should be the ones to purchase it from Mr. Wilkes. All agreed that the site of the current Tastee Diner is a notable landmark and a building that is very worthy of preservation for historical reasons. The Mayor has also asked the developer to allow the City of Laurel to have the right of first refusal for any future sale of the Diner. Those are quotes directly from the City’s press release, finally acknowledging what we’ve been trying to tell them all along. Now it’s time to hold them to it, and encourage them to explore the available options. But it has to start by talking with diner owner Gene Wilkes—and doing it with transparency this time. Mayor Moe has stated that the city-owned vacant lot at 312 Main Street will likely become a parking lot. I still say that site would be perfect to relocate the diner to—fully intact, and fully operational. As an official part of the Historic District, (and officially a historic property) it would become eligible for those preservation benefits we’ve talked about, which Preservation Maryland and Maryland Milestones will be all-too eager to assist with. Wouldn’t the City be more interested in developing the lot at 118 Washington Blvd. themselves? Wouldn’t a parking lot there make more sense, given the proximity to the MARC train station? These are all questions we need to consider over the next few days. I can’t begin to express how proud I am of the City’s Planning Commission for their unanimous decision, but we still need to call upon the Board of Appeals to uphold their recommendation. Please attend that meeting next Thursday, December 20th at 7PM at the Municipal Center. I sincerely hope the City of Laurel is listening this time around. Remember, despite this initial victory, the Tastee Diner is still up for sale. But now there’s a real opportunity—and path—for the City to do the right thing and make it a legitimate part of Laurel’s Historic District. “Today Laurel Mayor Craig A. Moe and members of his Senior Management Staff met with Ms. Francesca DeMauro-Palminteri owner of Pure Hana Synergy Medical Dispensary and the developer of the property at 118 Washington Blvd, Laurel, Maryland, and her development consultants and Mr. Douglas Hayes, Chair, City of Laurel Historical District Commission. All agreed that the site of the current Tastee Diner is a notable landmark and a building that is very worthy of preservation for historical reasons. It has never been the desire of the City or the developer to demolish or remove the Tastee Diner from its location. Ms. DeMauro-Palminteri has agreed with the Mayor’s proposal to keep the Tastee Diner in its location and reuse the building for her business, to allow the diner to be visible and not encapsulated by a structure around it and to provide for signage providing historical information about the Diner. It was also agreed that the developer would include in the development plans the placement of silhouettes in some of the windows of the Diner to further enhance the historic aesthetics of the building façade. Attendees saw new proposals for the renovation of the property and the thoughtful reuse of the Tastee Diner façade and building and agreed it met their goals and that of the community members who spoke at the Mayor and City Council meeting on Monday, November 26, 2018. Ms. DeMauro-Palminteri stated that she was “thankful to the community for their input and the assistance she has received from the City of Laurel.” Ms. DeMauro-Palminteri also stated she would be happy to work with the members of the Laurel Historical Society to donate some of the Tastee Diner furniture from inside the diner and signage. I was confused as well. Not by what is now being proposed, but by how we got here. Suddenly, the City is claiming that the diner “is a notable landmark and a building that is very worthy of preservation for historical reasons.” Most of them did not feel that way up until yesterday. The agreement that Mayor Craig Moe reached with Pure Hana Synergy is better than the alternative—that being the total encapsulation and hiding of the diner that was in their original plans. But it is in no way what I’ve been suggesting, and what over 1,900 people to date have signed the petition for. The petition calls for the City to explore ways to have the best of both worlds—to allow Pure Hana Synergy to still build their dispensary on the site, but to procure the historic portion of the diner, ultimately finding a developer who could revitalize it on Main Street where it could continue as a functioning, authentic diner. That has been my goal from the start. I posed that idea to Mayor Moe in an email on November 1st—exactly one month ago today, and weeks before starting the petition. He never replied. Despite a very select few at City Hall—chiefly Councilman Carl DeWalt—I can assure you that the City was not interested in preserving anything about the Tastee Diner. Which makes their press release ironic at best. When all of the facts come out, I think we’ll discover that Pure Hana Synergy was lead to believe that not only did the City have zero interest in preserving the diner, they were anxious to be rid of it—quickly and quietly. I think we’ll also discover that the reason they’re insisting on repurposing the diner (rather than the logical building of a new structure from scratch on the larger lot) is to take advantage of grandfathered utilities clauses that wouldn’t otherwise be available to them. That being said, I’m disappointed that the mayor decided to have a closed-door meeting, attended only by him and his “senior management staff”—which, curiously, did not include the City Council—and certainly not anyone from the Laurel Historical Society, who’d also lobbied for the removal and preservation of the diner car. This group alone created the unilateral agreement outlined in their press release. The agreement suggests that the exterior façade of the diner will now become an integral part of Pure Hana Synergy’s new building. But that’s all that will remain of it—the interior will be completely gutted, and the diner—one of only two remaining Comac models in existence—will be effectively destroyed. Yes, it’s a small victory that our historic diner will in some way be adaptively preserved, but let’s be honest—what a complete waste of a once-in-a-lifetime opportunity this was for the City of Laurel, and Main Street in particular. The integrated look that Pure Hana Synergy is now promising to create using the façade of the diner could have been achieved by a new developer on Main Street—where we would have still had a fully-functioning diner. The fact that the City was so unwilling to explore any of the many available resources to achieve this reflects poorly on its leaders. And the lack of transparency as it pertains to the CRA (the Donna Crary-led Community Redevelopment Authority that has purchased properties on Main Street which could have easily housed the relocated diner) is even more troublesome. Not once was the CRA part of the discussion, nor would the City respond to multiple requests to explain their absence. Keeping the Tastee Diner in its original location, even with this amended plan that promises to no longer encapsulate it, hardly saves it. It will, however, be a constant reminder of what might have been. NBC4’s Jackie Benson knew she was in Laurel Monday night, even if one of her video producers apparently didn’t. Laurel/Lanham… what’s the difference, right? Well, Laurel is the one with the rare Tastee Diner that may soon be disappearing. Benson was in town covering the Mayor and City Council Meeting. Or, just the City Council Meeting, as it were—attendees were informed that Mayor Craig Moe was actually still in Florida for the holiday. The reason for the local news coverage was the general public hearing, in which representatives from the Laurel Historical Society and the City of Laurel’s own Historic District Commission Chairman spoke eloquently in favor of saving the diner. That was it—no further elaboration. And whether Mr. Leszcz intended it or not, the impression it gave was that the Mayor and City Council don’t have a say in whether the sale of the diner is approved or not. That decision now falls on the Planning Commission and the Board of Appeals. That being duly noted, the purpose of calling attention to the Mayor and City Council in the first place was never to block to the sale of the property at all. It was simply to urge them to do their due diligence in exploring options that might allow them to successfully take ownership of the historic 1951 Comac-built diner car, and relocate it to benefit Main Street—without adversely affecting Pure Hana Synergy’s plans to build their dispensary at the diner’s former location. Mr. Leszcz, whom I know not only has a deep appreciation for Laurel’s history, but for the Tastee Diner itself—at the City Council meeting, he spoke at length of his fondness for it and his memory of the Tuozzo family, who co-owned the diner along with the Sussinis before Gene Wilkes took over in 1976. But you don’t have to read between the lines here to see that he hasn’t exactly been looking for a creative solution to save it. Why would he say that the City doesn’t have the money, when he literally just admitted that he doesn’t know how much it would actually cost to move the diner? That’s exactly why we approached the Mayor and City Council with this petition in the first place—to seek those answers. To seek out partners like Preservation Maryland and Maryland Milestones Heritage Area who are literally asking to help with this endeavor. Partners who have the knowledge and means to assist with grants and other incentives that the City Council seems to know very little about, frankly. And make no mistake, that’s their duty. Elected officials are supposed to have the City’s best interest in mind, and constantly seek creative ways to benefit Laurel for the long term. Not to simply facilitate a sale in the interest of “cleaning up” a blighted block. And honestly, my perception thus far has been that some at City Hall—certainly not everyone, by any means—have viewed this idea of saving the diner as an act of sheer folly; that it’s somehow an inconvenience to them to even have to entertain such an impossible notion of moving that diner. If that’s indeed the case, I think that’s incredibly shortsighted and irresponsible to not even consider what might be achieved on Main Street by preserving and revitalizing such a rare piece of history—a piece of history that is otherwise going to be lost so unnecessarily in the building of this dispensary. Mr. Leszcz’s comment about the City not having the money for something like this kind of stands at odds with another point he brought up at the meeting—about Laurel’s Community Redevelopment Authority, and their recent purchase of the Gude Mansion at Laurel Lakes, which I assume the City plans to extensively renovate with the idea of renting the facility out for weddings and such. That can’t be cheap. But then, good investments usually aren’t. Regardless, it prompted me to take a look at the public land records for these recent purchases, including the old Laurel Theatre at 312 Main Street, and the Laurel Town Lodge boarding house at 41 B Street. I’m sure these were wise investments–I don’t doubt that for a moment. They’re investments that will eventually benefit the city in various ways. But they raise two very big questions: are they any wiser than investing in relocating the diner to Main Street, where a new owner could be incentivized to renovate it into something truly special? And should the City really be so quick to dismiss a creative idea with the notion that they “don’t have the money”? That being said, the next step is the December 11th Planning Commission Meeting, followed by the December 20th Board of Appeals meeting. 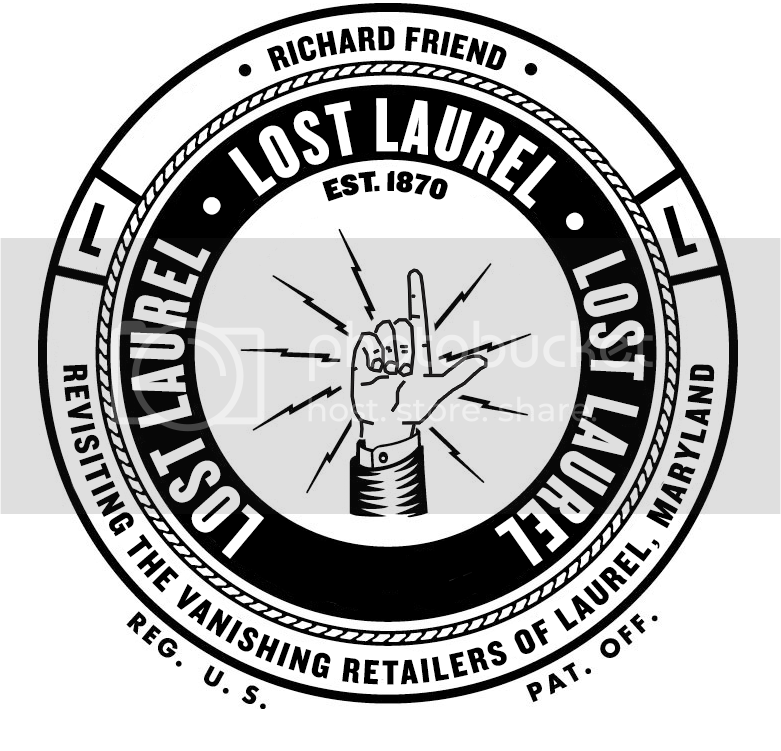 The content on LostLaurel.com was obtained in the public domain, created by Richard Friend, and/or permission has been granted for use on this site by the original owners—and is credited as such. Want to reproduce something from this site? Please ask first, and be sure to credit LostLaurel.com. Thanks! Postmark Laurel: Kickstarter campaign now live!